Myrofora Goutaki (centre) with the prize awarded by Katja Pier, member of the patients association management committee, and Professor Heymut Omran of the University of Münster, an expert on PCD and head of the GPP’s PCD group. Myrofora Goutaki of ISPM’s Pediatric Respiratory Epidemiology Group was honoured for her outstanding research in the field of primary ciliary dyskinesia at the 39th annual meeting of the Gesellschaft für Pädiatrische Pneumologie (the German-language Association for Paediatric Pulmonology). 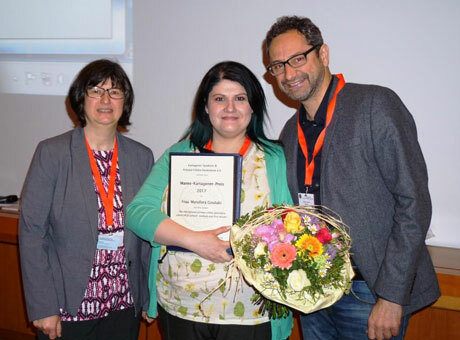 At the conference, which took place in Essen from March 30th to April 1st 2017, Dr. Goutaki received the Manes-Kartagener Prize from the Primary Ciliary Dyskinesia (PCD) patients association for her publication “The international primary ciliary dyskinesia cohort (iPCD Cohort): methods and first results”. The paper, published in the European Respiratory Journal, describes the build-up of the largest international retrospective cohort on PCD, with more than 3,200 patients from 19 countries. The iPCD Cohort was developed in the framework of the EU-funded project BESTCILIA under the lead of ISPM Professor Claudia Kuehni, and is one of the largest epidemiological projects of the COST Action BEAT-PCD. Professor Kuehni and her group recently received further funding from the Swiss National Science Foundation to explore this large dataset. The goal is to describe PCD disease course and severity predictors as well as possible existing disease phenotypes.